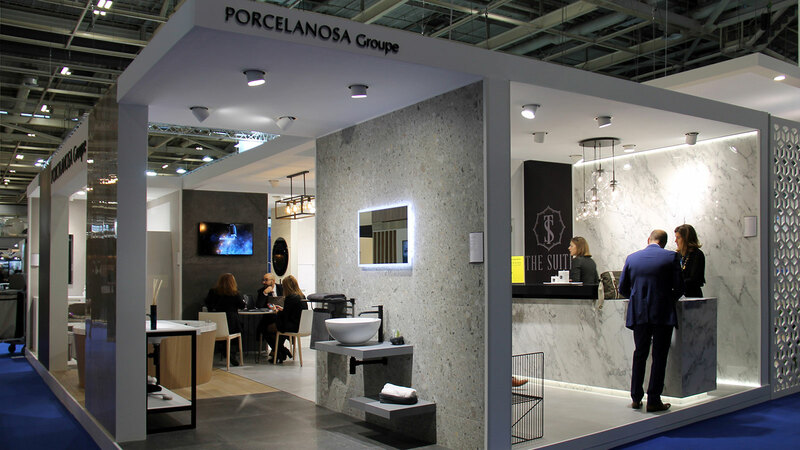 KRIONTM has participated alongside the PORCELANOSA Grupo at the EquipHotel international fair. The event, held from November 11-15 in Paris, brings together professionals who are involved in products and services for hotels, restaurants and catering. In this edition, more than 105.000 visitors have been able to see the innovations at first hand from the 1600 firms attending. The interest generated by KRIONTM in the contract sector, due to its aesthetic and technical possibilities, has been reaffirmed with the large number of visitors who have visited the stand. Also, we have the thermocurvable capacity and the jointless finish of this solid surface which, offers infinite possibilities in both creation and design. In addition, its mineral composition presents optimal antibacterial qualities for high-traffic spaces, along with resistance to wear and tear. The high fire resistance characteristics, respect for the environment, sustainability and its backlit effect, make KRIONTM the perfect choice for the hotel furniture sector. Work surfaces, hotel rooms, buffets, wall tiles and signage are just some of the applicable options. The exclusive service for A&D professionals (Architects & Designers Club), offers the contract sector all the initial advice for projects, which provides building solutions for the development and supervision of the execution stage. This custom-made service adds value to the designs, giving ongoing support to each different concept in order to achieve the very best result. Among the KRIONTM mineral compact properties, the K-Life series stands out for the accommodation sector. The photocatalytic material includes KEAST technology (KRIONTM Eco-Active Solid TechnologyTM) that purifies the air, breaks down organic stains and eliminates bacteria without undergoing technical or aesthetic variations. Health and safety benefits that are equipped with a balanced and cutting-edge aesthetic because of the "Snow White EAST" range. Chromatic purity.